Steve Pacer first caught the eye of Mike Rzepka in 2011. He thought he recognized the TV personality—Steve was a news reporter for an Albany ABC affiliate at the time—and after a bit of internet research, Mike realized the they’d attended SUNY Fredonia together and reached out. The two would go on their first date months later, and it was Mike who popped the question in November 2015—via the Tonawanda couple’s two cats. Instead of engraving the names Glory and Julie on the pets’ ID charms, he had “Will you” etched on one, and “Marry me?” on the other. The felines had a prominent role come wedding day, too. Their pictures adorned the antique bureau next to the place cards display. And later into the night, Steve hit the dance floor with a special wedding gift—a print of their cats, complete with laser background. 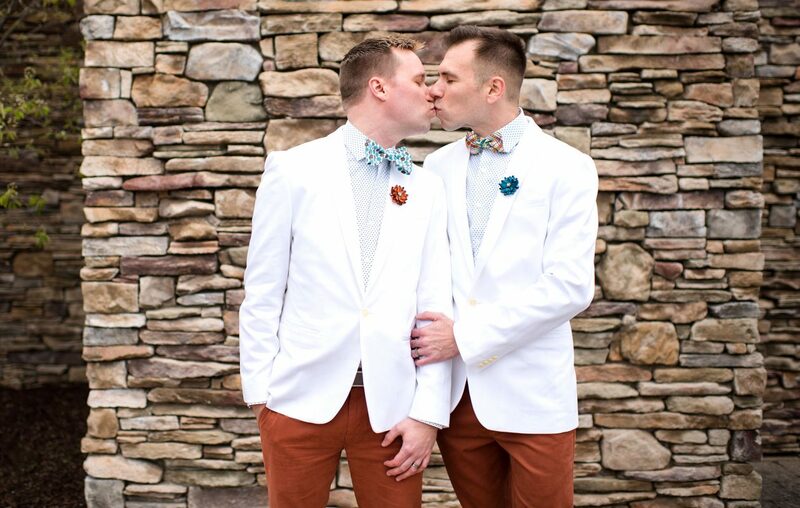 Both fairly fashionable fellows, the duo paired burnt-orange Banana Republic pants with white and teal polka-dotted shirts, white tuxedo blazers, boat shoes and fabulous teal and burnt-orange patterned bow ties with coordinating ribbon boutonnieres that they found on Etsy—where they also got their wedding bands made of deer antler and dinosaur bone fossils. They also opted for a short, non-traditional ceremony—officiated by their friend Cindy, who was ordained online for the occasion. “It was the first time we were the center of attention and we were a little nervous, so we didn’t want to be up there too long,” Steve said of the emotional ceremony where both men wrote their own vows. The ever-important first dance was the lesser-known yet highly personal, “I Belong to You” by Haley Reinhart. The rustic Timberlodge provided an intimate setting for both the wedding and reception, the latter featuring a gourmet buffet, popular sangria bar and s’mores over an open fire. Steve contributed in his own sweet way—decking out their dessert table with Girl Scout cookies and treats from Dairy Queen, where he worked as a teen and through college. The couple carted in boxes of Dilly Bars and ice cream cupcakes, decorated in their teal and burnt-orange color scheme.